Whenever I host a get-together at my place, my friends always find it amusing that I own so little. I’m 46, and I’ve never owned a couch or a kitchen set. A matching set of glasses, plates or silverware. I just don’t like being bogged down with a lot of stuff. The one exception is books. I’m a borderline hoarder when it comes to books. A friend of mine recently asked me why I don’t own an e-reader, since I like books so much. Actually, I do plan to get an e-reader one of these days. But as I told my friend, books are about more than just the content for me. It’s great that we live in a society where most people are literate and books are so readily accessible. But sometimes I think it’s a shame we tend to think of books as disposable objects to pass the time in an airport, rather than the precious artifacts prized by bibliophiles of previous centuries. David Groff’s translation of Miyamoto Musashi’s 17th Century Samurai classic The Five Rings is the type of volume that gives you an idea of how it must have felt for some book collector from a past era fondly looking over his personal library. Yeah, it’s an instructive – and surprisingly entertaining – book to read. But more than that, it’s a cool book to own. In his introduction, Groff gives a very good introduction to the life and times of Musashi, the Samurai whose musings on combat and life in general comprise the main text. The introduction isn’t overly long, but it gives a thorough explanation of who Musashi was, and the circumstances under which he wrote The Five Rings. And Musashi sounds pretty freakin awesome. As Groff points out, the enduring mystique about him likely has as much to do with his personality as with his expertise at swinging a sword. Musashi apparently had a kind of punk rock insouciance about him. Come on. How cool is that? Musashi’s text addresses a number of topics, ranging from one-on-one combat to staging a battle to just living your life. And here you can see more reason for his enduring legacy. Some of the passages are specific enough to make it historically interesting as a textbook for Samurai combat. You get an idea for the practicalities of everything from keeping your opponent disoriented to making good use of the terrain. But for those of us who never expect to get in a swordfight or storm a castle, there’s still plenty of practical advice on topics such as readying your mind for a struggle, and reconciling yourself to the idea of death. 1) They’ll try so hard to make themselves relevant to business executives listening to them on the morning commute that they’ll lose any sense of poetry, or of the original context in which they were written. 2) They’ll get TOO poetic and New-Agey, so you forget that they were written by and for people dealing with the practicalities of the real world, and not as a voiceover for some synthesizer-heavy New Age music album with unicorn art on the cover. Groff avoids both traps – providing a work that’s educational yet readable; suitably sparse yet evocative. Oh yeah … I was talking a little earlier about books as artifacts. The hardcover edition from Watkins Publishing is just gorgeous. The binding. The coloring. The tasteful art that nicely complements the typography. It might make a good coffee-table book. If I owned a coffee table. 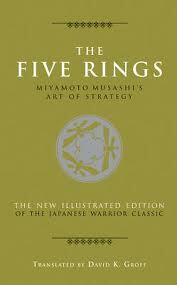 Why oh why is this book not more popular, and more widely known, than THE ART OF WAR? I read it a while back and it is as much fun and as interesting to read as you say. Good question! Hard to say. It’s been a while since I read “The Art of War.” But my guess would be that Sun Tzu’s work dealt more combat involving large numbers of people — as opposed to individual combat — and with esoteric concepts such as directing energy. As such, it would be easier for modern publishers to market it as a work for business executives. I liked the fact that The Five Rings, for all Musashi’s talk about the Buddha and making use of “emptiness,” is essentially concerned with hard-headed practicalities. Of course, it still has plenty to offer modern readers beyond simple historical interest. I believe this new translation will make it more popular in the Western world.